We have previously featured dining rooms with chalkboard decoration in it where we sure had fun browsing the featured photos. With the good feedback we received, we feel like adding another bunch of features, but for the kitchen areas this time. Chalkboards are really nice. You can either paint a wall with chalkboard paint or paint other areas of the space as well. Even a table with chalkboard paint can look exceptional especially when the writings are already there. But aside from that, a framed chalkboard will work well too. 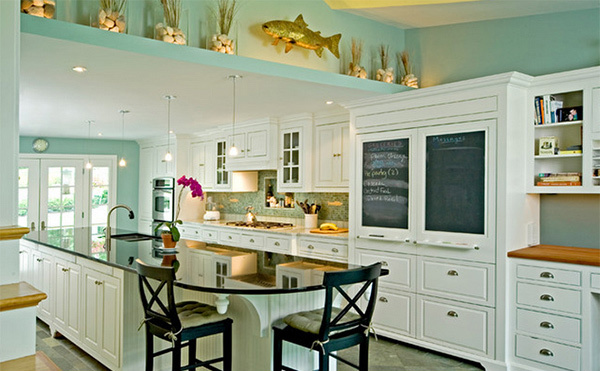 So, we have collated images of kitchens that have chalkboard decorations in them. We were amazed on the variation of usage for that item in these spaces. Indeed, creativity brings us a long way! Chalkboards are very useful for the kitchen because you can always write the grocery list and items that you need to buy on them. With this, you will surely not forget anything when you go to the grocery. 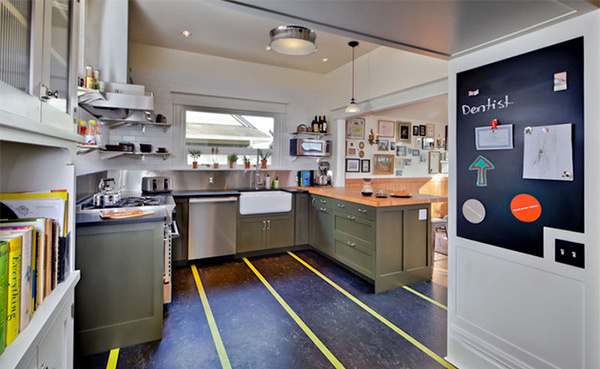 If you are unsure of how a kitchen would look like with a chalkboard, then check out the list below for some ideas. Aside from the colors in it, the wall that was painted with chalkboard paint is totally beautiful. We are sure your eyes were driven to the stripes on the floor but take a look at the neat chalkboard with some post-it on it. 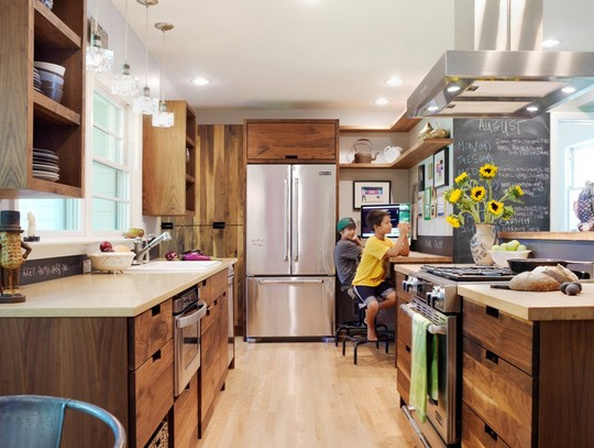 When you see this kitchen, you will think that this is just like the usual kitchen where Mom cooks the meals but no, check out that chalkboard on one side of the wall! 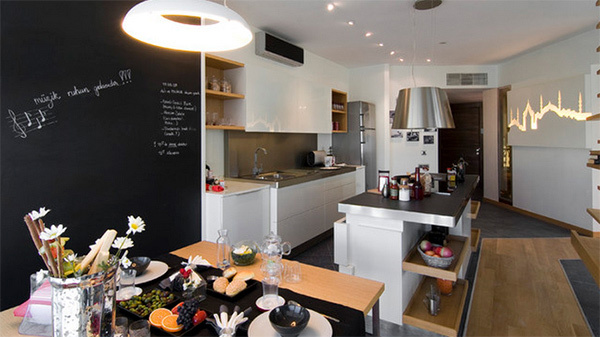 We love how the chalkboard area looks so dark that it enhanced the look of this kitchen. We’d guess that those written on the wall are the ones prepared for breakfast. 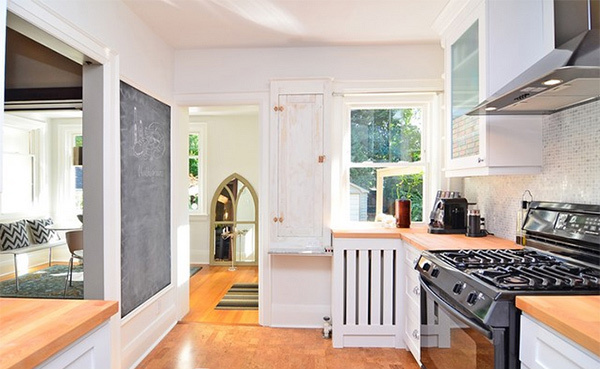 A traditional space where in the cabinet doors were painted with chalkboard paint. 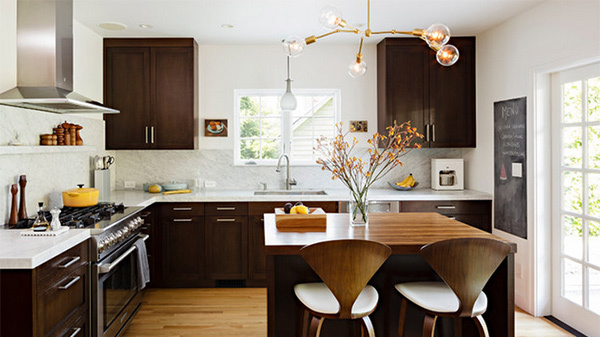 This contemporary kitchen is a sure win because it looks very beautiful. 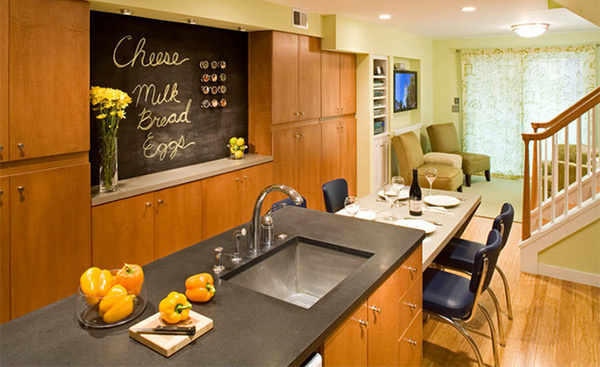 That blue countertop adds some personality to the space and the chalkboard also matched well with it. Look at the names near the counter height stools. For sure the users will sit on their designated places! Well, unless they erase the names and interchange it. What a lovely space this is! The wall with chalkboard paint on it has a beautiful writing and art too. 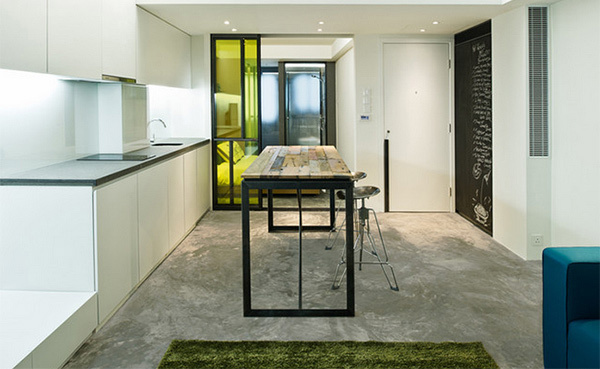 A white kitchen with a shopping list written on the chalkboard area. Guess that is really what this area is for. 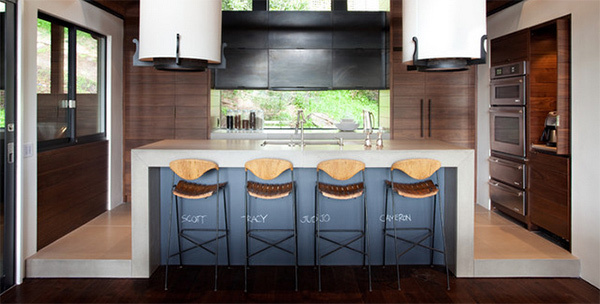 Wood is used in this kitchen with the addition of the chalkboard making it appear rustic. Beautiful. We love the look of wood and white combined. 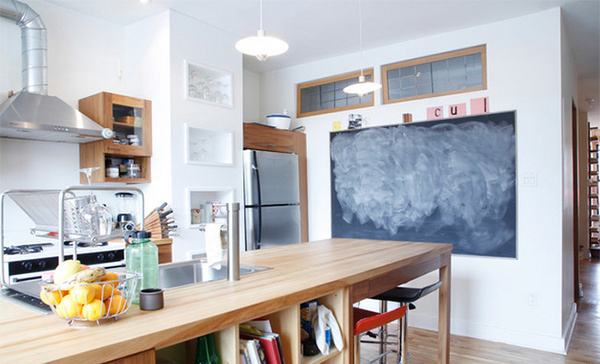 That chalkboard certainly added an artsy factor to the kitchen. Look at the wine holder, isn’t it lovely? And yes, it is placed on top of the chalkboard area with some wine menu it. The dark colors of the space expanded it visually. 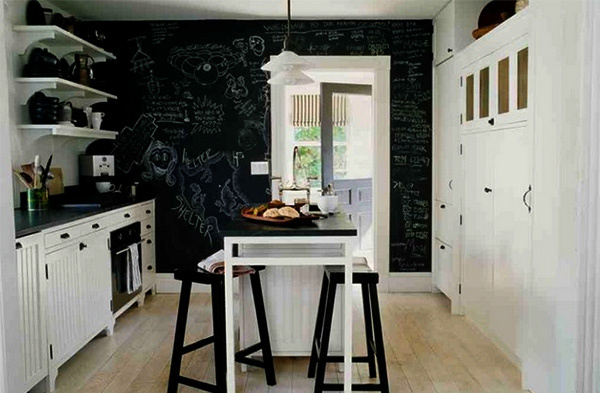 Adding a chalkboard wall blew up the kitchen’s space. Isn’t it cute? Well, now you believe that chalkboards really look great in the kitchen. 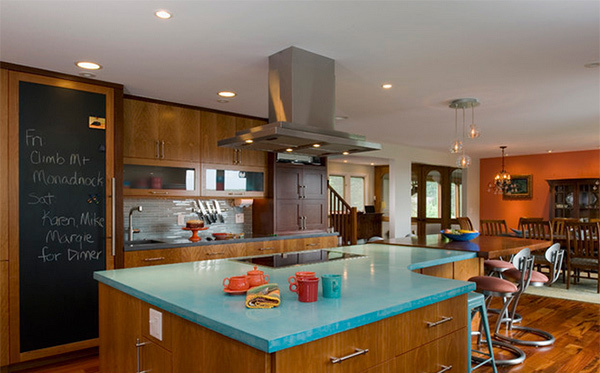 For sure after seeing the list, you ended up thinking of adding one to your kitchens too. We can’t blame you because aside from being a decoration, it sure is useful too. 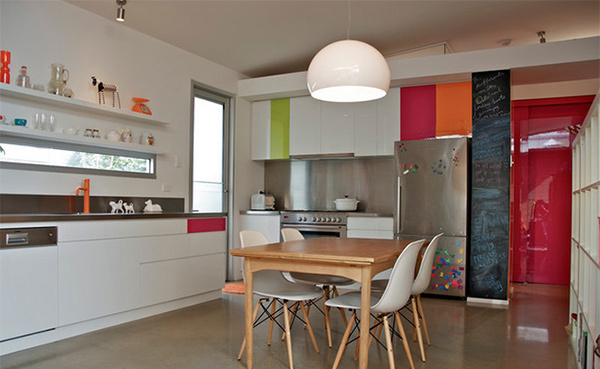 Now take a look at dining room with chalkboard accents and tell us what you think of it.